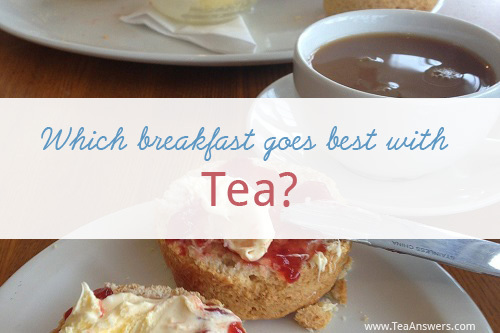 Breakfast & Tea: Which Breakfast Goes Best with Tea? You are here: Home / Eat & Drink / Which Breakfast Goes Best With Tea? I love breakfast with tea. I can’t imagine not having them together. I love my breakfast tea so much I don’t choose which tea to go with my breakfast. I choose the breakfast that best complements my tea. Maybe you enjoy a bowl of yogurt and strawberries with a steaming cup of orange pekoe on the side. Or perhaps you prefer oatmeal with your tea. Or a muffin. For most tea lovers, a cup of tea is a key component to any breakfast. It doesn’t matter if you’re eating at home, sitting in a café, or eating breakfast during your commute to work. Tea is such a big part of breakfast that when you go to any caf´, diner, or restaurant for breakfast, you can expect to receive a pot of water and a nice selection of teas to brew in it. You have your tea and what’s left? Choosing which breakfast to go with your tea. If you’re at a hotel or café, you have a wide range of choices – eggs, bacon, sausage, oatmeal, pancakes, fruit, scones, and more. But everyday isn’t a special occasion breakfast or a get-together with friends. What is your personal breakfast favorite to have with your tea? For a time, I had yogurt and fruit every morning with my tea. It was quick and easy – perfect for the morning rush out the door to go to work. Smoothies and muffins are easy too. When I stayed at hotels, I would often have more time for breakfast, enjoying eggs and tomatoes with a nice strong breakfast tea. But deep down, I think I like my breakfast tea with a bagel and cream cheese best. There’s something about a warm bagel that’s so comforting…and with a cup of tea alongside it, I feel so safe and relaxed – all my cares are a million miles away. Just the thought of it brings a smile to my face. What about you? What do you like with your tea for breakfast? And be sure to see what everyone else has listed as their favorite breakfast to have with tea.